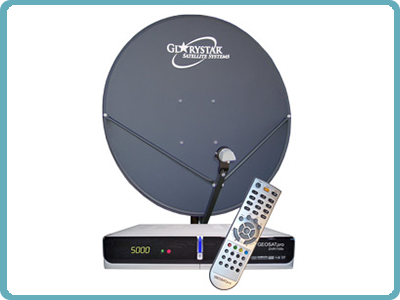 The Glorystar one room standard satellite system is an inexpensive solution for receiving Glorystar. Glorystar channels, yet doesn't need to record the TV and Radio programs or pause live TV. 60 Christian Television and Radio channels with one satellite dish with no monthly fees or service charges! all available channels. New channels are automatically added to your receiver without any complicated programming in the menus or expensive service call US. digital television and radio services directly from the satellite. More Christian channels are available from a Glorystar Satellite System than from any other provider! The ideal satellite broadcast coverage is one that transmits a signal to a broadcaster’s intended viewer base. MPEG-II Digital & Fully DVB Compliant. Size (W x H x D) 10.25" x 2" x 8"
Size (W x H x D) 10.25" x 2" x 9"